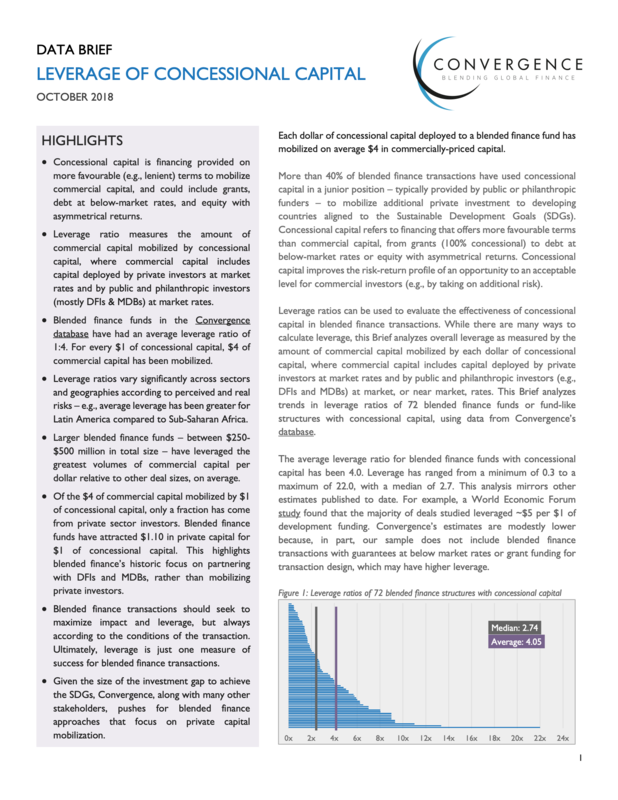 This Brief is a preliminary effort to benchmark leverage ratios for a sample of blended finance funds. Leverage ratios across blended finance funds have varied significantly, from a minimum of 0.30 to a maximum of 22 in this data set. Any effort to benchmark leverage ratios must be differentiated according to the conditions of the transaction, including the target sector, country, and impact outcomes. For example, deal sponsors have seen larger leverage ratios, on average, for blended finance funds targeting Latin America and the Caribbean, compared to Sub- Saharan Africa. On average, blended finance funds have leveraged $4 of commercial capital for every dollar of concessional capital. However, only a fraction of this commercial capital has come from private sector investors. This may highlight blended finance’s historic focus of blending concessional capital with commercial capital from DFIs and MDBs, as opposed to mobilizing private sector investment. Given the size of the investment gap to achieve the SDGs, Convergence, along with many other stakeholders, urges practitioners to design and scale blended finance approaches that focus on private sector mobilization. While leverage is a key component of blended finance, leverage ratios are just one indicator of the success of a blended finance transaction. Leverage ratios, if a desired metric, should be considered alongside other conditions (e.g. instrument, geography, region, and target outcomes), so as not to shift undue focus on commercial viability over development outcomes. Blended finance transactions should seek to mobilize additional sources of financing for projects aligned to the SDGs in developing countries, but only as suitable for the specific context of each project.